These can be found among the pre-agricultural villages of the Near East. These houses were part of the first villages, initially only ‘base camps’ for nomads who were making the transition to a more sedentary life. The Natufian culture ( named after a site at Wadi-al Natuf in Israel) started 15,500 to 12,500 BC in an area in Jordan, then extended to cover the Levant, from Euphrates to Sinai between 12,500 to 10,000 BC. These were the earliest evidence of sedentary communities: pre-agicultural hunters, gatherers and “harvesters of cereals”. The houses grouped together in clusters of about six , in villages covering about 2,000 square meters. They were partially built into the ground with sides supported by stone walls. The homes had one or two hearths and leave traces of concentric circle of posts, and signs of substantial construction. 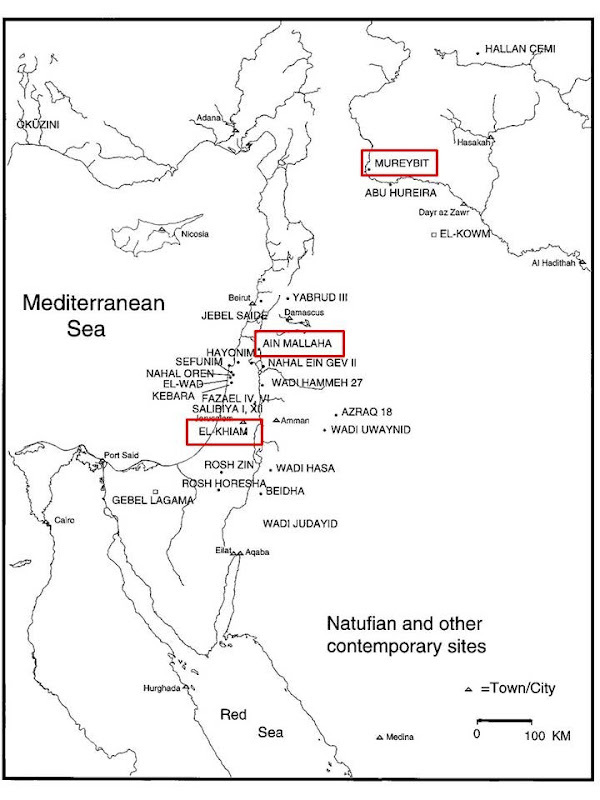 Fine examples of Natufian houses were uncovered in, among others, Ain Mallaha. Every base camp suggests the rebuilding of houses, indicating temporary abandonment of the settlement. Domestic structures were about 3 to 6 m in diameter, with either rounded or squarish fireplaces. A rare case is the semicircular housein Ain Mallaha which is 9 m in diameter, where a series of post holes was preserved. This was followed by the Khimian Phase around 9,500BC, named after the Khiam site west of the northern end of the Dead Sea. Here the round houses came out of the ground and clay appears to have started to be used as building material. The next step in the evolution of houses occurred in Mureybetian culture that came about 9500BC, named after the site at Tel Mureybet near the Euphrates in Syria. Here the first rectangular constructions known in the Near East, or in the world first appear (though some houses have rounded corners). Houses and stores were built out of chalk blocks chipped into cigar shapes and bonded with mortar. The houses are more sophisticated with special raised sleeping spaces, seperate hearths and storage areas. They had flat mud roofs supported by joists. 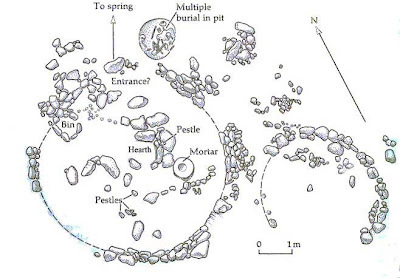 Between the houses were communal open spaces with several large fire-pits – pebbles stored the heat from the fire lit on its surface but retained the heat and stored it over a longer period. This was where communal cooking done. The great innovation of the Natufian, Khimian and Mureybetian cultures was sedentary life sustained by the old hunter-gatherer practices, as well as the harvesting of wild cereals. Nomads and hunter-gatherers control their population by weaning the number of children by not weaning them for two years to limit the size of the group which is continually o the move; sedentism allowed the intervals between births to be reduced. The people then went on to unselfconciously ‘selected’ wild cereals which they deemed more suitable. 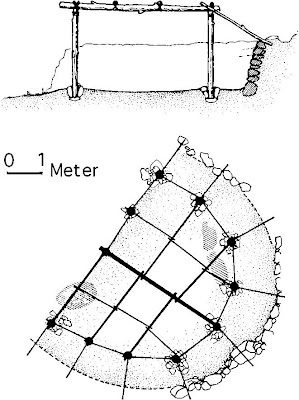 The evolution of the circular houses into rectangular ones with rectangular rooms appear to be a response to to the consequences of sedentary life and farming. There was now more need for storage space , for larger families. There was also greater need to defend their villages now they had more material possessions to protect. Rectangular houses allowed more people to be gathered into small spaces: box-shaped rooms and houses fit together more efficiently, allow more interior rooms, and makes use of more shared walls.